Penny stock trading is not for the faint of heart. In the blink of an eye, price spikes and crashes can create and lose fortunes. The allure of penny stocks is the opportunity to ride on the coattails of soaring share prices but it’s not all roses and rainbows. Cheap stocks can be manipulated more easily. And they are generally less well regulated. But if you’re not deterred by the risks, you’ll find many top online stock brokers support trading in stocks under $5 (which the SEC defines as penny stocks). Not every stock broker supports penny stock trading. For example, you might expect that top options broker, tastyworks, would offer cheap stocks trading under $5 on the over-the-counter bulletin board. But they only support stocks trading on exchanges as opposed to stocks trading on the pink sheets. The selection of penny stocks on the TD Ameritrade thinkorswim platform is enormous. Beyond its support of stocks listed on the New York Stock Exchange and NASDAQ, thinkorswim caters to Pink Sheets, QX, and QB listings. That means pretty much any stock you may wish to trade is available for purchase on TD Ameritrade thinkorswim. Beware when picking cheap stocks under $1 that they may include companies that have been delisted from major exchanges and face serious business challenges. While some penny stock companies will undoubtedly be solid bets, you’ll need to be extra diligent to separate the wheat from the chaff. If you’re not sure where to begin, the thinkorswim penny stock screener can help you filter out the duds from potential winners. As with other top penny stock brokers on the list, TD Ameritrade thinkorswim has no minimum deposit requirements to get started. Don’t let the term penny stocks fool you into thinking risks are low when buying cheap stocks. Ally Invest understands that tradable penny stocks can be volatile and tacks on an additional penny per share charge to its regular rate when stocks are priced under $2 per share. However, Ally Invest limits the maximum commission per order to no greater than 5% of the trade value. Ally Invest Select pricing drops the base rate by $1 to $3.95 but that requires placing 30+ trades per quarter or maintaining a daily balance of $100,000+. Experienced traders who want a trading platform that any professional would relish should look to TradeStation. The desktop platform, web trading platform, and mobile app all offer similar trading capabilities. The backtesting and screening tools are virtually unparalleled. And the TradeStation Simulator rivals any virtual trading platform offered by rivals. Ambitious traders who want to design custom strategies even have the ability to do so. The downside is the account minimum is not quite zero but at $500 it’s very reasonably priced. TradeStation is best for active traders who may wish to choose the alternative pricing plan of $0.01 per share on the initial 500 share purchase and $0.006 per share thereafter. No matter what kind of trader or investor you are, Schwab can pair you with the service you want. Schwab is best known for bringing low cost trading commissions to the masses and won’t disappoint penny stock traders. Although its account minimum is not zero, Schwab promotions may put money back in your pocket. Deposit $10,000 or more and cash bonuses ranging from $100 → $500 are available. Otherwise, you’ll need to pony up $1,000 to get started. If you do, two trading platforms are offered and the selection of penny stocks is extensive as you might expect. If penny stock brokers with no minimum deposit requirements are your number one consideration then the TD Ameritrade thinkorswim platform and Ally Invest are your best bets. Ally Invest tacks on an extra penny per share charge to its base rate commission. And because you can scoop up a lot of shares when you’re buying cheap stocks, the total costs could add up in a hurry. For that reason, our top pick is the thinkorswim platform. 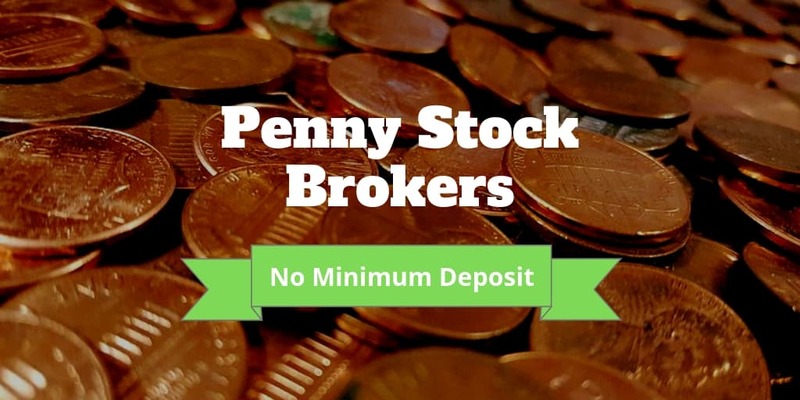 Other top online penny stock brokers are Schwab and TradeStation, however both impose low minimum deposits. Between the two, TradeStation is best for traders seeking a professional-grade platform. For most penny stock traders, Schwab has a solid offering with some enticing sign-up bonuses for clients willing to make large initial deposits.